For much of the country, we have begun to experience colder temperatures. What does that mean to the automotive paint industry? These colder temperatures play a part in paint curing. Colder temperatures mean many issues to overcome in paint drying. While a heated shop may seem to be an obvious solution, this does not solve the issues. As a matter of fact, it often creates new ones. Below we identify some of these issues and share some options in resolving these issues. orange peeling (where the paint will resemble and feel like the skin of an orange). drying paint takes considerable longer time to cure in cold temperatures. Creating a greater chance for paint to drip and run. With the colder weather and painting in a heated environment we must remember the result is the presence of condensation. When bringing a vehicle into a heated garage from the colder climate it creates a thin layer of condensation. This thin, almost unnoticeable layer of condensation makes for adhesion issues and paint flaws. Much like the condensation which forms on the outside of a cold glass bottle or drink on a warm day. 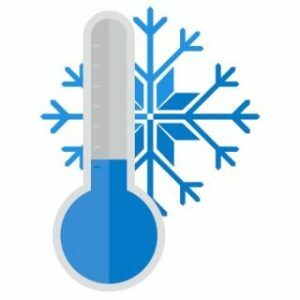 To avoid condensation issues allow the cold vehicle to set in the garage bringing its temperature to the temperature of the garage, approximately 4-5 hours. Unfortunately in this industry time is money. Just as important make sure your auto paint, primers and surfaces are all stored at the right temperature and aren’t allowed to freeze. What is the ideal temperature for auto painting? The preferred temperature lies between 60 and 76 degrees. It is important to have a shop that is well insulated, heated, well-lit, with adequate ventilation, as well as a controlled humidity. The importance of a well-ventilated garage or auto finishing shop is most important for health and safety issues, and most state and federal regulations. Without proper ventilation you may as well end up with micro-dust particles in your paint job, and paint fumes, of which are extremely dangerous and flammable. The importance of making sure your vehicle is clean and free from any and all de-icing salts and solutions is a must prior to beginning to paint. Salt residue is nearly impossible to see and leaves an almost invisible layer which can cause paint defects. After cleaning the vehicle with a conventional silicone remover, you must be sure to use a water-based silicone remover. *Salt will only dissolve in water, so these water-based cleaners will ensure no salt residue is left behind. We hope this helps and is a benefit to you as we enter this cold weather season. Also please consider BECCA for your waterborne and solvent paint needs. Whether it is pray gun cleaning, solvent recycling, decreasing your dry times with our FLASH DRY drying system, or our consumables which take every process to a new level. Keep BECCA in mind this season. ← You Have Options To Drying Paint!